White terry baby bib fits size newborn to six months. This is the perfect bib for the police officer's new baby. It has been embroidered with the thin blue line shield and the words, My Mommy's Life Matters, or My Daddy's Life Matters. Below the writing are three silver stars. 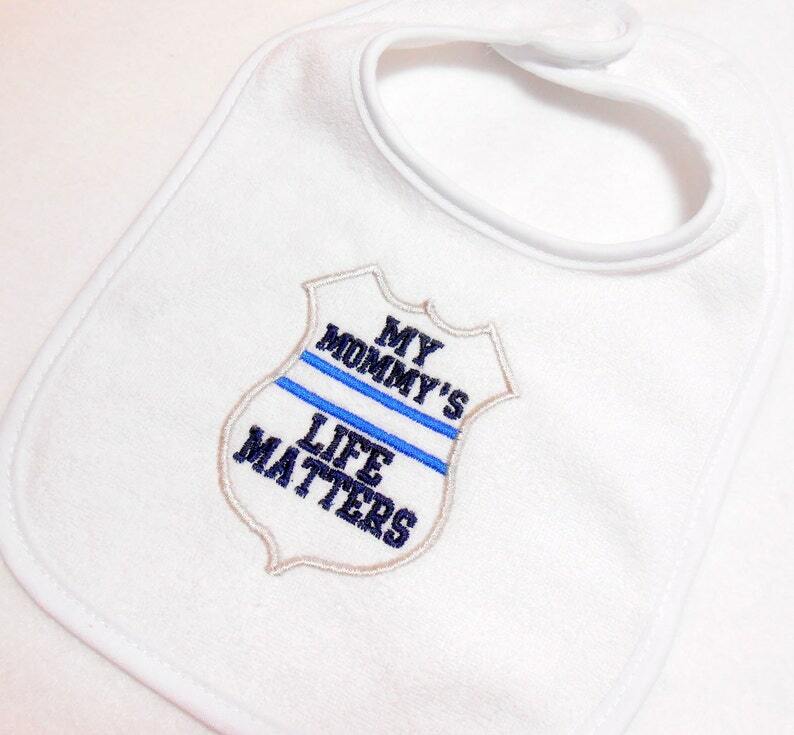 This bib is the perfect baby shower gift for the law enforcement officer. The velcro closure is located at the back of the bib. This bib is 79 percent cotton and 21% polyester. Care instructions: Fasten closure before washing. Machine wash warm with like colors. Only non chlorine bleach when needed. Tumble dry low. Do not iron. I do have other bib colors available. Please contact me if you would like it in another color. Always remove a bib before putting your little one to bed or down for a nap. They are not intended as sleepwear. To prevent skin irritation from formula, food, etc., please be sure to remove the bib when baby is done eating. I use a very high quality stabilizer on the top and bottom of my designs to assure a quality look. If you have any questions, or have a design you would like to have done, please feel free to contact me.